We are pleased to invite you to participate in the All-Russian Scientific Conference with International Participation “Mechanisms of microorganisms adaptation to different habitat conditions”, which will be held on 4 – 7 June, 2019 in Irkutsk. Mechanisms of microorganisms adaptation to environmental factors. Microorganisms adaptation to the habitat conditions in the host organism (animal, plant, human). Biofilm formation as one of the forms of microorganisms adaptation. Purposeful use of the adaptation potential of microorganisms in biotechnology. Therewith, it is planned to hold the School: “The use of structural bioinformatics methods in studying the physiology of microorganisms”. Acceptance of application forms with the title of the report – until January 21, 2019. Mailout of the second information letter – January 25, 2019. The Conference language is Russian and English. We are pleased to invite you to participate in the International Conference “Information Technologies in the Research of Biodiversity” http://bit.icc.ru, which will take place on September 11–14, 2018 (followed by the master class on data mobilization skills on September 15–19) in Irkutsk, Russia at Matrosov Institute for System Dynamics and Control Theory of Siberian Branch of Russian Academy of Sciences. Integration of modern information technologies and classical methods of biodiversity research enables reaching new levels of knowledge acquisition. New demands on researchers require coordination, standardization and unification of data and methods. The conference includes plenary and sectional reports, round tables, and master classes on the publication of biodiversity data for use in basic and applied research to provide you with principles for working with existing biodiversity information systems. Those interested in participating can register electronically via http://bit.icc.ru. Applications for master class on data mobilization are collected before 1 May 2018; for details and application form see http://www.forbio.uio.no/events/courses/2018/Data_mobilization_Baikal.html. 1. Coordination of research interactions to digitize, standardize and publish data on biodiversity in Russia and other countries, as well as promoting and spreading modern international principles, resources and tools for working with biological data. 2. Consideration of modern principles for creating and integrating local and regional information system projects for biodiversity research in Russia and other countries. 3. Creation of infrastructures for implementing technological and information support to organizations seeking to exchange data and data analysis methods. 4. Development of specialized software for handling biodiversity research tasks. 5. Networking and exchange of experience, advanced technologies and trends in the field of distributed databases and data processing. 1. Global biodiversity data portals: data integration, use in knowledge generation tasks. 2. Information and analytical systems on biodiversity. Virtual natural history collections. 3. National data on biodiversity: the current state of digitization. Copyright issues, methods and concepts for assessing data quality. 4. Theoretical fundaments and organization technologies of the information and telecommunications infrastructures. Standards for describing digital data, processing services, etc. 5. Methods, models, software systems and Web services for the analysis of biodiversity data. 6. Application of remote methods in vegetation mapping and biodiversity research. May 20–15 June, 2018 – confirmations of registration, conference and visa invitations. August 30, 2018 – conference program online, arrival info. September 11–14, 2018 – conference dates, including excursion. September 15–19, 2018 – master-class on data mobilization skills. The conference will be dedicated to critical issues of contemporary cell biology related to the status of research of molecular mechanisms regulating functions of energy transforming and storing eucariotic cell organelles. Research achievements in the following domains will be presented: regulation of mitochondrial and chloroplast genes expression with the use of genetic engineering approaches; modification of nuclei, chloroplasts and mitochondria genomes aimed solve fundamental and biotechnological problems. As it was announced earlier, the IInd Russian Conference with the international participation “Problems of studying and preserving the plant world of Eurasia”, dedicated to the memory of Doctor of Biological Sciences, Professor, Honored Scientist of the Russian Federation Leonid Vladimirovich Bardunov (1932-2008) will be held on September 11-15, 2017, starting in the city of Irkutsk and further continuing in Kyren, a township in the Republic of Buryatia closed to the foothills of Eastern Sayan Mountains in the territory of the Tunkinsky National Park. Let us invite you to participate in the II All-Russian Conference with the international participation “Problems of studying and preserving the plant world of Eurasia”, dedicated to the memory of Doctor of Biological Sciences, Professor, Honored Scientist of the Russian Federation Leonid Vladimirovich Bardunov (1932- 2008). 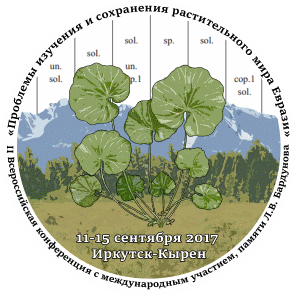 The conference will be held on September 11-15, 2017 in Irkutsk and in Kyren, a township in the Republic of Buryatia in the territory of the Tunkinsky National Park in the picturesque foothills of Eastern Sayan. The application form and the questionnaire should be received by the Organizing Committee before May 3, 2017. Deadline for submitting materials is June 30, 2017. We are pleased to invite you to the All-Russian Scientific Conference with international participation «Resistance factors of plant and microorganisms under extreme natural conditions and in technogenic environment» scheduled for September 12 – 15, 2016 at the SIBERIAN INSTITUTE OF PLANT PHYSIOLOGY AND BIOCHEMISTRY SB RAS (SIFIBR SB RAS). The conference will incorporate Young Researchers’ School sessions. Physiological-biochemical protective response of organisms to the impact of abiotic and biotic factors. Adaptation of organisms to technogenic environmental pollution. Genetic mechanisms of organisms resistance. Modern methodological approaches to testing organism and phytocenosis resistance.